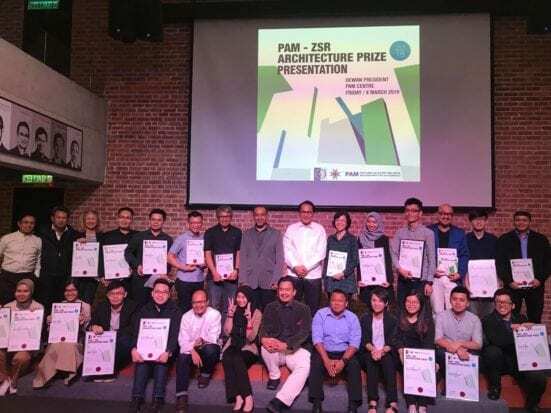 Kuala Lumpur, March 8, 2019 – Universiti Teknologi Malaysia (UTM) Architecture students and their advisors from the Faculty of Built Environment and Surveying have made outstanding achievements at the PAM-ZSR Architecture Prize 2018 price giving ceremony. They have won prizes from two categories namely, the B.Sc. (Arch. Program) and the Master’s (Arch. program). As for the B.Sc. (Arch. Program) category, David Nee Zhi Kang has emerged as one of the top three winners, taking home with him a certificate and RM3,000 award. His project was known as the ‘MTC Timber Gallery + Resource Centre’ and was supervised by Associate Prof. Dr. Mahmud Mohd Jusan. For the Part 2 category, the Master’s (Arch. program), UTM team has again dominated the prizes offered by winning two of the top three winning awards. For each award, the team members secured a certificate and money worth RM5,000. In addition, six out of the seven finalists for this competition went to the UTM M.Arch. students. They were Wong Tian Ming for his project ‘Mosque as Bridge of Culture’ supervised by Ar. Samsiah Abdullah, and Rashidah Jimi Sham for her project ‘Low Energy Courtyard Training Centre’ supervised by Associate Prof. Dr. Mohd Zin Kandar. The other finalists were Lim Wen Jie for his project ‘Future Cities Farming Research Centre’ supervised by Dr. Doris Toe Hooi Chyee and Wilson Tan Zern Ee for his project ‘Visual World’ supervised by Dr. Sharifah Salwa Syed Mahdzar. To Ngew Kah Sheng, this ceremony was a rewarding experience when he became the finalist for two projects ‘Shining in the School’ supervised by Associate Prof. Dr. Mohd Zin Kandar and ‘A Self-Sustained Community Elderly Housing’ supervised by Associate Prof. Dr. Tareef Hayat Khan. All finalists took home a certificate and RM1,000 award for each of their winning project. The prize presentation ceremony was held on March 8, 2019 in Kuala Lumpur. Congratulations to all the students and advisors.